InfoPath 2013 is sticking true to the continuing support statements that were made about the software by releasing a standalone version. For anyone who was running the Office 365 ProPlus edition of Microsoft Office, it was not possible to also run InfoPath. Thankfully this has now changed and the standalone version can run side-by-side with Office and is now available to download from Microsoft. I ran the install and everything worked great! 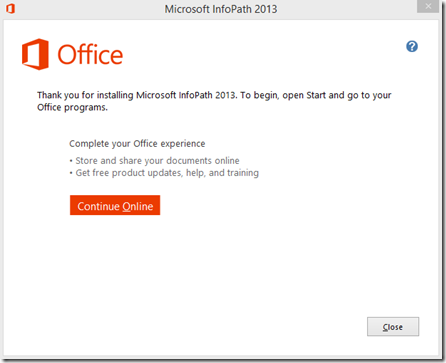 Should I still be using InfoPath in my SharePoint or O365 projects? To continue with a favorite consultant response unfortunately is "it depends…" InfoPath is supported in Office 365 and is supported in SharePoint Server 2016 so it is not going anywhere soon. This is a question that I hear a lot and I wanted to put down my high level recommendations. There are plenty other 3rd party or development solutions that would ensure better longevity. If you want to discuss any unique scenarios, please reach out to us and we can work on a strategy that best fits your business needs.